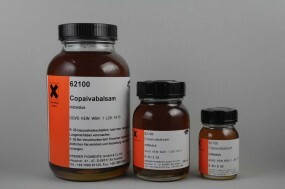 Copaiba Balsam | Balsams & Wax | Solvent-soluble Binders | Mediums, Binders & Glues | Kremer Pigments Inc.
Copaiba Balsam comes from South American tree Copaifera landsdorfii. It is highly viscous, with a characteristic fruity odor - it has a high content of essential oil. It is also mentioned in some late 18th-early 19th century texts as a medium to protect Verdigris from darkening or changing color in oil, as well as in recipes to prepare a paint vehicle for Asphaltum. Doerner mentions its use by restorers, notably in the `Pettenkofer Treatment´ for dried-out, brittle paint films to increase their refractive index and improve their appearance. The sticky film can, however, collect dust, and the varnish would remain susceptible to solvents. Customer evaluation for "Copaiba Balsam"